Here is a special breed of fishing boat, designed for the Sportsman, water skier, or commercial fisherman who need a small craft to carry loads in rough water. 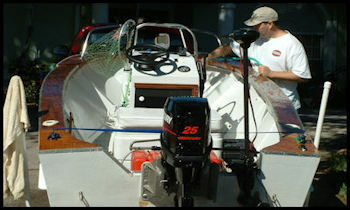 With its modified vee bottom and heavily flared vee bow it breaks up choppy water and throws it to one side instead of letting it fly back into the cockpit. It runs equally well with a 7 1/2 HP engine or with a 40 HP it will really step out and tow water skiers. There is so much room you can stride around the steering console and up to the roomy bow and back without bumping your shins. You'll be proud to own a Commander 14. Generous Sea Going dimensions make the Commander ideal for offshore use on lake, bay or ocean. Look at the specs. plenty of beam for big boat appearance and rough water use. Proven performance with the Commander steady and smooth at below planing speeds with 7.5 HP, yet all the zoom of a speedboat with outboard motors of medium to high horsepower.